Have you been told you have an infection in your tooth roots? Are you thinking of having a crown or veneer? Then a root canal treatment could be the option for you!! Under your teeth is your tooth root and this contains pulp. Years ago, teeth with diseased or injured pulps were extracted. Today root canal treatment gives dentists a safe and effective means of saving teeth. The pulp is made up of nerves, blood vessels, and connective tissue, which are important in tooth development. There are very small canals within your tooth and they can become infected quite easily. This causes the pulp inside your tooth to become infected also. Pain and swelling may accompany the infection. Even in the absence of pain, certain by-products of a diseased pulp can injure the bone that anchors your tooth in the jaw. 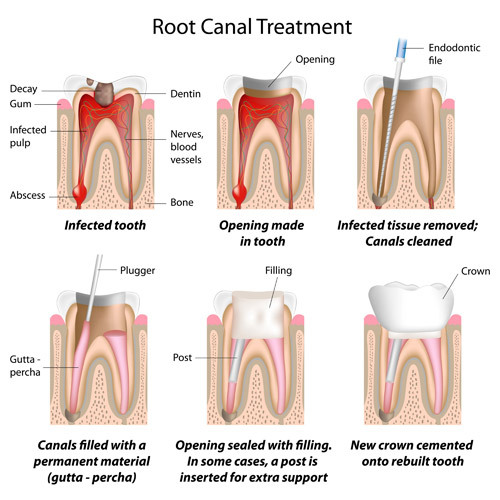 Root canal treatment this is one of the safest and most effective methods of saving a damaged tooth. The pulp chamber and root canal(s) of the tooth are cleaned, shaped, filled and sealed to prevent recontamination of the root canal system. If you are considering a dental crown or veneer, it will need to be determined if you need a root canal treatment first prior to having the crown or veneer placed. Most of the time root canal treatments will only require one trip with 1-3 visits to the dentist. It’s a relatively simple procedure with little or no discomfort. Here at Dental Getaways we will assist you with finding out if you are a suitable candidate for the root canal and what can be achieved for you to ensure you have a beautiful healthy smile. With cost effective, pain free dentistry why wait, contact us today!